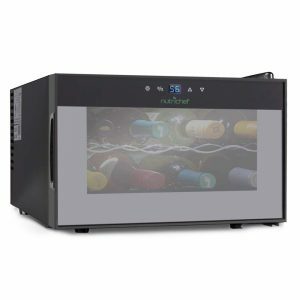 NutriChef PKTEWC806 is a compact thermoelectric wine cooler chiller cellar with a 23-liter or 8-bottle capacity. Thanks to its mini size you can use it on the floor in any room of your house or your kitchen countertop. Being a thermoelectric type unit there is no compressor and works very quietly. 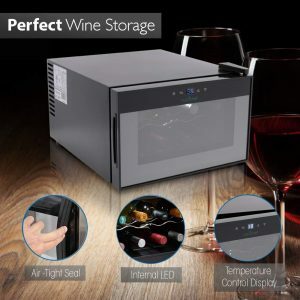 The mini NutriChef Wine Cooler has been released only recently, so there are only a few customer reviews and ratings online. The average rating is 4.6 out of 5 stars at the time of this review and indicates a reasonable amount of customer satisfaction. It has a very modern design with a recessed door handle, a polished chrome rack that glides out smoothly. The LED-backlit display panel shows the temperature in Celsius and Fahrenheit. You can adjust it via the temp up and down buttons between 46 and 64 degrees Fahrenheit. You have the light button for the interior blue LED light and the Celsius and Fahrenheit converter. You can store up to 8 bottles of regular sized and shaped red and white bottles and you can always remove the chrome shelf if you want to put larger or different shaped bottles in. With the accurate precision thermoelectric cooling it will get to the temp you set it to reasonably quickly and pretty much stay there unless the ambiance temperature is not very hot. You can expect the consistently stable temperatures- more so than other thermoelectric coolers. This is helped by the integrated circulation fan and there is a ventilation grill at the rear. It is designed as a beautiful compact unit for freestanding use wherever you want in your kitchen- floor or countertop, living room or home office. It looks good in stainless steel with the reinforced glass door with the airtight seal and a recessed handle. The NutriChef PKTEWC806 weighs 19.18 pounds and measures 19.5 x 16.1 x 10.6 inches and will fit under any kitchen cabinet. With an efficient thermoelectric system rather than a compressor that does cycles, it works super quietly. You’d have to really try and hear any noise. This is a premium looking and feeling high-end commercial wine cooler with all the bells and whistles. And it is covered by a decent warranty by NutriChef for total satisfaction. It is very easy to operate straight out of the box. You can basically plug it and set the temperature and watch it doing its job well. Overall it offers good value for money!